Awesome, I have listened to it on computer. Trying to download it to a cd or dvd having been able to as of yet so I can use it at my piano. You are truly the best teacher I have ever had. Have enjoyed the sheet music I printed. Teaching me things I never knew. 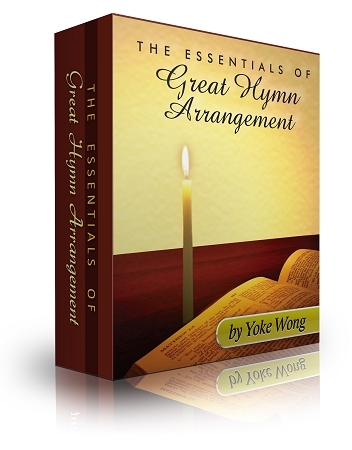 Thanks, Donna F.
I'm absolutely LOVING the Essentials of Great Hymn Arrangement course. My 1st experience watching Yoke Wong teach in depth an actual course, other than the wonderful clips in newsletters, YouTube, etc. Her emphasis is on teaching through examples, carefully explained step by step for even the beginner to grasp. Then the student is left to work through each technique, play the examples, then apply the theory behind it to create his/her own improvisation, runs,fills, etc..and apply to other songs. While I'd love to see sheets of all the lovely improvisation that flows from her spontaneously I do understand the greatest benefit comes from her approach: watch, learn work through, then take off flying on our own & have fun! This is an EXCELLENT and COMPREHENSIVE course, by a TOP NOTCH INSTRUCTOR! Hoping there will one day be a Hymn Arrangement II aimed more toward the intermediate level, but in any case, I'd jump on any other hymn sequel, or even one on Country Style Piano by Yoke Wong. My focus is evangelistic gospel, mixing with ballad style, with a bit some country tossed in where appropriate! I think Yoke Wong is queen of such a style. Tho the Definitive Improvisation course covers much more than my chosen field, now that I've seen how she teaches, will probably order it next, knowing there'll be plenty to learn and adapt. What a joy to have Yoke Wong as a welcome guest in my living room, right on my bench, available 24/7..totally charming, inspirational, and what I need most, so easy to learn from! I give this course the highest rating. I was at a Church Service and the pianist did a cascading run while playing 'IT IS WELL'. I was like wow!. The other pianist was looking over his shoulder in amazement. I was determined to play that good. This is by far the best money I have spent on a piano course. Wong's arrangement is so beautiful. If you already play for a church and you want to sound alot better. Then this is a must buy. I can assure you you will not regret it.